Rare miniature cabinet. Augsburg. Early 17th century. ‘Meubles de maîtrise’ are miniature masterpieces of creativity. 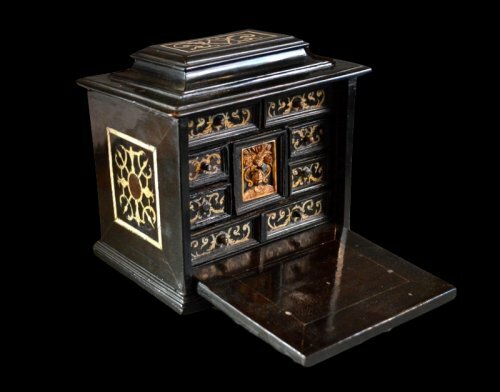 Miniature pieces of furniture have always aroused the passion of collectors and lovers of ‘meubles de maîtrise’. 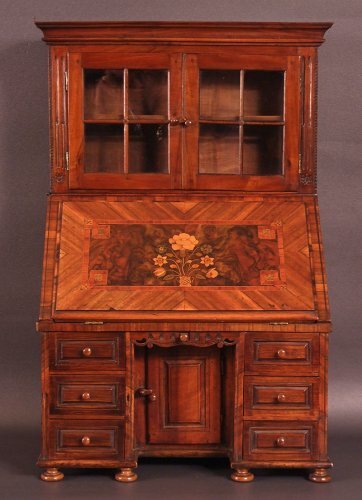 A cabinetmaker’s apprentice had to make a miniature piece of furniture (‘meuble de maîtrise’) to demonstrate his skills and pass his ‘examen de maîtrise’ in order to become a master cabinetmaker or compagnon (a journeyman employed by a master craftsman). The ‘meubles de maîtrise’ attest to the excellence of the decorative arts on a reduced scale. Between the sixteenth and nineteenth century, prestigious commissions required the prior creation of a model or a reduced-scale model, which were validated before the full-scale pieces were made. Miniature pieces of furniture and Lilliputian objects have for centuries aroused the keen interest of antique dealers and people who are passionate about miniature antiques.